And what would it even look like? Another trend is manufacturers embracing full-screen phones that don't increase the size of the whole device. 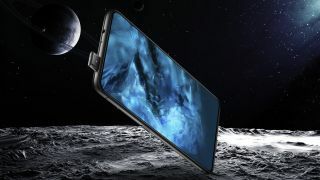 By shrinking down bezels and bringing the important sensor tech into a notch – that's a cutout section at the top of the display – companies such as Apple with its iPhone X have managed to include larger screens while keeping the overall size of their handsets largely unchanged. While some of these features are certainly interesting they're not exactly game-changing, so are we getting close to hitting peak smartphone? Is innovation in the space ending, or are we just experiencing a lull before the pace picks up again? And could we ever see the perfect smartphone? "That’s a strange position to take, and I feel you should always challenge your work (and other people's work) to further improve it." Who'll be the first to fold? It’s expected that this next-generation technology will enable you to play 4K content on the move, stream games directly to your phone and much more. 5G won’t be on your phone for a while yet, but it’s something that's definitely in the works, and which is set to change the way we use our devices. So how about that perfect phone? The truth is, 'perfect' in this context is difficult to define. Different people want different features, so not everyone will agree on what’s the ideal device. It’s part of the reason why we're starting to see specialist phones such as the Razer Phone, which is specifically designed for gaming, or the Sony Xperia XZ2 Premium, which is close to release at the time of writing and which is optimized for those who want to watch 4K video and movies. There would be a starter device – that was called the Endos – which would be the basic frame that would become your phone. You would then be able to add the features you wanted by buying extra 'modules' and slotting them into the phone. Want a super powerful high-end camera that you don’t mind protruding from the phone slightly? You'd be able to get one. More interested in having a huge battery pack that would last for two days? You could order one online that would be thicker than average, but would do the job. Perhaps one day we'll see a fully modular phone come to the market, but in 2018 no company seems to be developing this particular idea. It's also possible that the form of our phones may change dramatically in the quest for the perfect device. The Design Museum's Alex Newson doesn't think that will happen soon though. "The phone still seems to be the place where people want the convergence of features," he said. "When you put too much into a watch or too much into a pair of glasses, it has been ultimately rejected. Perhaps one day we will indeed be wearing our phones on our faces, enabling us to message, search, play games and more all without having to root around in our pockets, and by barely lifting a finger; but whatever form the phones of the future take, it's likely that hypothetical perfection will remain just over the horizon. It's hard to imagine us ever reaching the stage where we can agree that we've seen the perfect smartphone – or even on what it should look like.